One rainy afternoon last week, looking through our family photo box, I found a picture of my three-year old daughter, Allison, hunting Easter eggs in Denver, Colorado, wearing her blue Easter dress and fancy white bonnet. This was one of the few times she kept a hat on for any length of time, especially a hat with an annoying ribbon. Quick, I told myself, take the picture. Now. She won’t keep that hat on long. And she didn’t. The hat came off as soon as she found the first egg for her basket. I also found a picture of my seven-year old son, Phil, in his jacket and tie, hunting eggs before church. Being older he always found more eggs, but was kind enough to share with his little sister. The kids are grown now with busy lives and children of their own, and live in different cities. We text, send emails, chat on the phone, and visit back and forth, as any empty-nester parent knows. No matter what dinner I plan, there are memories lodged in my heart from long-ago Easters with happy children decorating eggs all over the kitchen table; waking up Sunday morning to find baskets the bunny never forgot to leave; dressing for church; the joy of hunting eggs early in the morning with dew still on the grass; and finally church and Sunday School, with lessons about the risen Christ, then Easter dinner, and afterwards, serious attention to baskets and chocolate bunnies. Now time has marched on. Our photo box holds pictures of so many Easters and other holidays as well ~ Thanksgivings, 4th of Julys, birthdays, weddings, grand kids being born. Adding up the years can be overwhelming. Like today, with Easter upon us so soon. I am grateful my kids grew up to be caring adults, with children of their own for dying Easter eggs and all that involves. At my daughter’s for Easter a few years ago, the bunny (named Albert in their house) left a basket on the breakfast table with my name on it, with my very own chocolate bunny. I felt like a child again, and could bite off those ears any time I wanted. 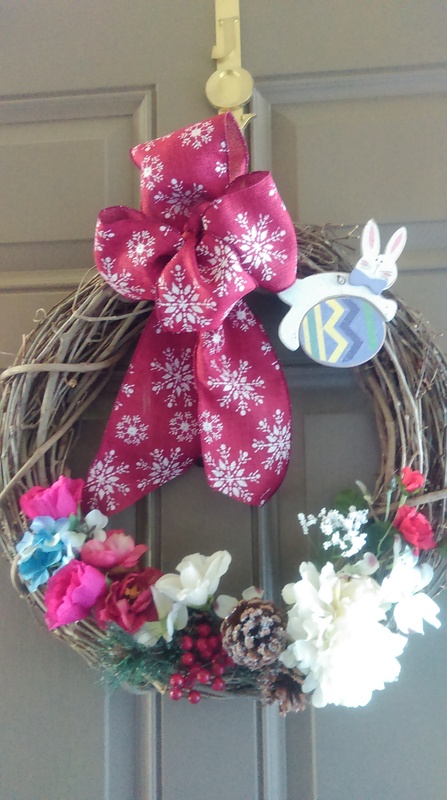 Today there is a wooden bunny in our front door wreath, and an Easter table runner from my mother-in-law on the dining room table, with a wicker basket and colored eggs from my friend, Gail. On Easter there will be a turkey breast in the oven, and probably dressing. There might even be a cake. Rainy days or not, I am filled with gratitude whenever I look through our family photos. The pictures still draw me into sounds of laughter, happy faces and fun, no matter which pictures or which occasions. Sometimes I can still taste the cakes I baked. It’s as if I am in the middle of it, surrounded by children and love. This Easter there will be cards, phone calls and e-mails. The kids are gone, we’re older, the holidays smaller, and it’s OK with us. It’s just different. But as I think about it, the rain has gone, the sun has come out, and it’s a beautiful day to shop for a brand new cake plate. After all, no matter how many years have slipped by, where the kids live, how we touch base this Easter, or how much the bunny may have slowed down, she still lives deep within my heart. That’s something that’s never going to change. This entry was posted in Change, Gratitude, Life and tagged Balance, Easter, Joy, Love, Memories, Photos, Seasons, Treasures, Words. Bookmark the permalink.